(Nanowerk News) An international research group led by scientists at the National Institute of Standards and Technology's (NIST) Center for Nanoscale Science and Technology has developed a method for measuring crystal vibrations in graphene. Understanding these vibrations is a critical step toward controlling future technologies based on graphene, a one-atom thick form of carbon. They report their findings in the June 19, 2015, issue of Physical Review Letters ("Strong Asymmetric Charge Carrier Dependence in Inelastic Electron Tunneling Spectroscopy of Graphene Phonons"). Carbon atoms in graphene sheets are arranged in a regularly repeating honeycomb-like lattice—a two-dimensional crystal. Like other crystals, when enough heat or other energy is applied, the forces that bond the atoms together cause the atoms to vibrate and spread the energy throughout the material, akin to how the vibration of a violin's string resonates throughout the body of the violin when played. And just like every violin has its own unique character, each material vibrates at unique frequencies. The collective vibrations, which have frequencies in the terahertz-range (a billion billion oscillations per second), are called phonons. Understanding how phonons interact gives clues as to how to put in, take out or move energy around inside a material. In particular, finding effective ways to remove heat energy is vital to the continued miniaturization of electronics. One way to measure these tiny vibrations is to bounce electrons off the material and measure how much energy the electrons have transferred to the vibrating atoms. But it's difficult. The technique, called inelastic electron tunneling spectroscopy, elicits only a small blip that can be hard to pick out over more raucous disturbances. "Researchers are frequently faced with finding ways to measure smaller and smaller signals," says NIST researcher Fabian Natterer, "To suppress the chaos and get a grip on the small signals, we use the very distinct properties of the signal itself." Unlike a violin that sounds at the lightest touch, according to Natterer, phonons have a characteristic threshold energy. That means they won't vibrate unless they get just the right amount of energy, such as that supplied by the electrons in a scanning tunneling microscope (STM). 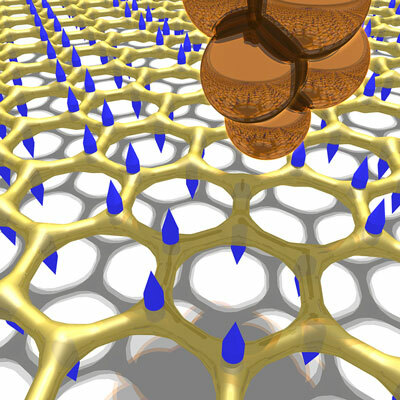 To filter the phonons' signal from other distractions, NIST researchers used their STM to systematically alter the number of electrons moving through their graphene device. As the number of electrons were varied, the unwanted signals also varied in energy, but the phonons remained fixed at their characteristic frequency. Averaging the signals over the different electron concentrations diluted the annoying disturbances, but reinforced the phonon signals. The team was able to map all the graphene phonons this way, and their findings agreed well with their Georgia Tech collaborators' theoretical predictions. According to NIST Fellow Joe Stroscio, learning to pick out the phonons' signal enabled them to observe a peculiar and surprising behavior. "The phonon signal intensity fell off sharply when we switched the graphene charge carrier from holes to electrons—positive to negative charges," says Stroscio. "A clue to what's initially enhancing the phonons' signals and then causing them to fall off are whispering gallery modes, which become filled with electrons and stop the phonons from vibrating when we switch from hole to electron doping." The team notes that this effect is similar to resonance-induced effects seen in small molecules. They speculate that if the same effect were happening here, it could mean that the system—graphene and STM—is mimicking a giant molecule, but say that they still don't have a firm theoretical foundation for what's happening. The high purity graphene device was fabricated by NIST researcher Y. Zhao in the Center for Nanoscale Science and Technology's Nanofab, a national user facility available to researchers from industry, academia and government.